“GUILTY.” A man is sentenced to death in front of your very eyes. Then comes the audible gasp of the audience as the stage in front of them transforms into a gallows and a terrified young man screams his innocence as he looks deep into the abyss below. The audience is mortified…what if he is innocent? What if the jury have got it wrong? Are they sending an innocent man to his death? Witness for the Prosecution was adapted for the stage by Agatha Christie and the premiere was held in 1953 in the Winter Garden Theatre, London. Peter Saunders, Christie’s theatre producer, had suggested that she adapt her short story “Traitor Hands” for the stage. Her response was to tell him that if he wanted a play he’d have to write it himself. Saunders duly took up the challenge, but Agatha was not impressed with his work, dismissing it and writing it again from scratch. Leonard Vole has been accused of murdering a wealthy widow for her money. This is life or death for Vole. As each witness is brought forward, can he convince the judge and jury (and the audience) of his innocence? Both the setting and the outstanding performances from all involved keep you gripped throughout the proceedings. In a tale of murder, passion, betrayal and justice, the scales keep falling from one side to the other and his life hangs in the balance. On the one hand you can watch the play as a nice Agatha Christie Who Dunnit, but on the other hand it leaves you wondering about how flawed the justice system is. People are so easily manipulated. In these days of a consumerist society, we are so easily swayed into buying or even doing things that we don’t want/to do. We’re unable to say no to our children anymore for fear of being disliked or embarrassed as we’re screamed at and publicly humiliated. In a society that now seems to be unable to think for itself, what makes us believe that our justice system is fair? What if a jury could be so easily manipulated…what if the jury members can’t face the prospect of perhaps being the only one in the room to stand their ground for what they believe to be the truth? A good criminal can ensure that their lawyer believes every word that they say. A good lawyer, a lawyer that has been taught to win an argument, counter every move, dispute the oppositions claims, has the ability to throw a jury off the scent. But just because the lawyer can win the argument, it doesn’t mean that justice is done or that all of the evidence in the trial is valid. Truth, can be twisted. The “facts” presented to the jury can see an innocent person hang and a guilty person walk free. Watching a murder mystery play staged in a court room as historic and beautiful as London County Hall is not to be missed. 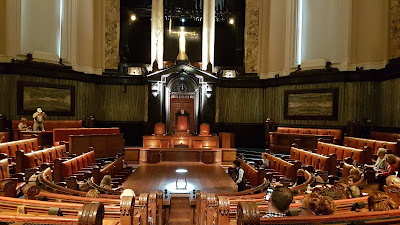 From the moment you are summoned to take your seat (a plush leather seat where no view is a bad view) you feel as though you are inside The Old Bailey. It is mesmerising watching this small stage space transform from dock to chambers and back again, but it is also a reminder that the law is based in theatrical rituals, if it wasn’t; there wouldn’t be so many court room dramas on the TV schedule. The set, the production and even the echoed sound of usher’s summoning the witnesses to the stand, all reinforce that we are in a criminal court rather than a theatre. 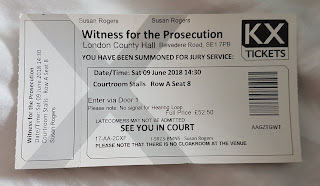 Witness for the Prosecution is an entertaining play, with a thoughtful and unsettling reminder about how many innocent people may have seen the hangman’s rope. 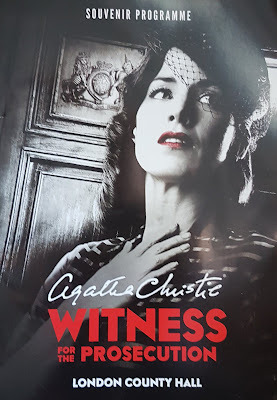 The play has been extended until March 2019, and it is definitely worth seeing, whether you are a fan of Agatha Christie or not. You have therefore been summoned. I’ll see you in court!